My favorite colors from the Worlds Away collection by China Glaze are the brighter cremes. Shocker there. I'm having a difficult time using the shimmers and glitters for interesting nail art, but I'm not giving up on the challenge to use them, and I'm confident that something amazing will come out of them soon. However, in the meantime, I have a bright geometric pattern to show you today, using three colors from the collection: Escaping Reality, Def Defying, and Hanging in the Balance. I really like these three colors together. They're dancing on the edge of being neons, especially when you mix them together. I recently saw The Nail Network's swatches of all the collection, and that'll give you the best color representation of the polishes solo. Check out those swatches here. As you can see there, they're not exactly neons, but when you pop a pink with a bright blue, your eyes play tricks on you. In this case, my camera lens was the one playing the tricks. This was a really fun design to do in addition to how fabulous the final look is. It's nice to break up the holiday trend with a little brightness now and then. I love these colors together! 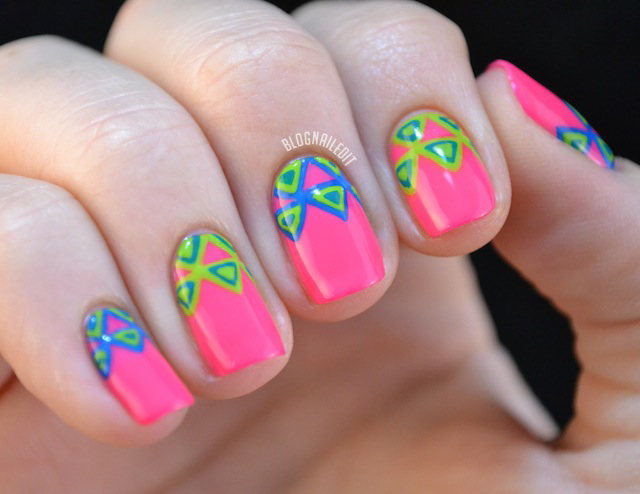 Such a bright fun mani!!! I'm not a fan of anything that looks "tribal", but I surely love the color combination!! Gorgeous manicure! I love the combination of colours! Thats such a fun combo! I'm amazed by your nail art! Not just this one in particular) Your designs are so gorgeous and truly unique, I can't even imagine how much talent is needed to create such wonderful designs! Super fun and creative, I love! Love these colors together! Gorgeous!